I wish I'd stopped and taken a picture of myself straddling the parallel. It would go with a collection of similar straddles: across the equator in Uganda, across the Arctic Circle in Finland, and across the 42nd parallel. Other latitudes form important state lines: the four corners is at the 37th parallel and the 109th meridian. Colorado's northern boundary follows the 41st parallel. 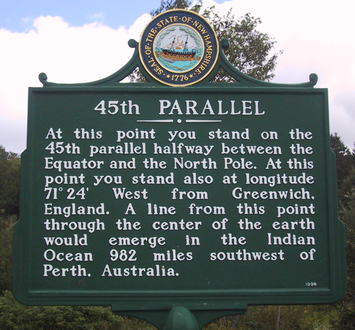 And famously, the 49th parallel comprises the largest part of the US-Canada border. The special 45th parallel, however, is explicitly reflected in political geography in only two places: it forms Montana's southern boundary with Wyoming. And more significantly, it forms the northern boundary of New York and Vermont against Quebec. Only four states lie entirely north of the 45th parallel: Alaska, Washington, Montana (almost), and North Dakota. The biggest cities are Seattle and Portland. The parallel divides the Minneapolis-St. Paul area. So counting six million from Washington, 2 million each from Oregon and Minnesota, and about 3 million from everywhere else, approximately 13 million Americans live north of the 45th parallel – or 4% of our population. Now consider Canada. That country's southernmost reach is Middle Island in Lake Erie, just south of the 42nd parallel. (My mother often told me that Canada was south of California.) The 45th parallel passes north of Barrie, Ontario, which means the Toronto Metro area and Western Ontario are to the south. Further east, St. John, NB lies just to the north, but Halifax, NS is just to the south. Montreal, Ottawa, and all western cities are north of 45. I'll guess that about 25 million of Canada's 34 million people live north of the 45th - about 74% of the population. So while almost all Americans live to the south, a large majority of Canadians live to the north. So if one wants to distinguish the US from Canada by a single straight line, the 45th is as good as any. It is much better than the iconic 49th, since the largest Canadian cities are well south of that latitude. Heading east, the 45th passes through the southern tip of Crimea, and splits Kazakhstan and Mongolia in half. The only parts of Russia lying south are Vladivostok and the northern Caucasus. Japan, China and the Central Asian republics are almost all to the south. In Europe, the parallel runs through Southern France and Northern Italy. To a very rough approximation, it follows the Pyrenees-Alps mountains. In the continental EU, only Bulgaria, Greece, Spain and Portugal lie entirely to the south. The parallel wouldn't have been the worst way to split up the former Yugoslavia: Zagreb is to the north, and Belgrade in the south. Further, the Serbian region of Vojvodina and the Romanian region of Transylvania are north. These areas both have large Hungarian minorities, formerly part of the Austro-Hungarian empire. Irredentist movements in Hungary might happily settle for a boundary at the 45. A reasonable population estimate for north of the 45th counts 200 million in the former USSR, 370 million in Europe, and 30 million in Canada, for a total of 600 million, or 10% of the world's population. Is this surprising? Not really – one wouldn't expect many people to be living at the north pole. But come to think of it, you'll be surprised by how surprising this number really is. A reasonable rule of thumb is that cities at the same latitude will have the same average annual temperature, as they get the same amount of sunshine at the same times. Thus while Minneapolis certainly has colder winters and hotter summers than Portland, on average it should come out right. I learned this again on my last visit to Portland – summer nights in Portland are cold! But the rule of thumb doesn't apply when something truly bizarre affects the climate. And that bizarre thing is the Gulf Stream, which heats Europe 5+ degrees latitude more than it should. Thus Milan (at 45) has a San Francisco climate; London, Paris and Berlin feel like Portland; Oslo, Helsinki and St. Petersburg are similar to Vancouver; and even Murmansk can't be worse off than Anchorage. Thus the surprise is not how few people live north of 45, but rather how many. For of the 600 million northerly souls, only 5% of them live in North America. That means that subarctic Eurasia has nearly 20 times the population, but probably only 3 times the land area. Thus there is a seven-fold higher population density in northern Eurasia than there is in North America. I'm surprised. To quantify the surprise, the appropriate Gulf Stream comparison line through Europe might be at the 52nd parallel rather than 45. I chose that latitude as it roughly corresponds to the Baltic coast. Thus France, Germany, Benelux, Ukraine, Poland, and major parts of European Russia lie between 45 and 52, along with smaller countries. Estimating that combined population at about 400 million, and subtracting that from the 600 million, we get a more reasonable sub-arctic population estimate of about 200 million. So 200 million live in the northerly Eastern hemisphere, and 35 million live in Canada – a ratio of nearly six to one. I'm still surprised, but can no longer account for the discrepancy. Is life really that much easier in Finland? There is another half-way latitude worth mentioning. What latitude splits the earth's surface in half? If you did the above calculus assignment, you will immediately know the answer: the 30th parallel. Half the earth's surface lies within 30 degrees of the equator, and half beyond. The 30th parallel does not correspond to any political geography - it goes through Jacksonville, Baton Rouge, Beaumont, and Austin, before entering Mexico southeast of El Paso. So the United States mostly lies between the 30th and 45th parallels. Now isn't that just the very best of temperate climes? Submitted by xijozx1122 on Thu, 05/07/2015 - 02:16. Submitted by johnz308 on Fri, 05/01/2015 - 14:48. Submitted by xijozx1122 on Mon, 04/20/2015 - 07:33. Submitted by xahgzr1122 on Thu, 04/16/2015 - 03:00. Submitted by xijozx1122 on Sat, 04/11/2015 - 09:11. Submitted by johnz308 on Fri, 04/10/2015 - 06:31. Submitted by xijozx1122 on Thu, 04/02/2015 - 07:38.